It's the newest Pirates hangout in Allegheny County, and it has your name all over it! 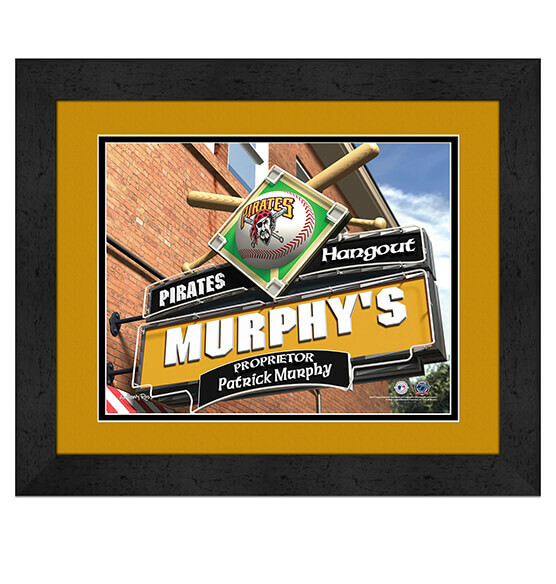 This clever "sign of a sign" Pittsburgh Pirates Personalized MLB Pub Sign Framed Print features your name — or whatever name or nickname you specify to be added to the marquee. With its signature black and gold colors, Pirates team logos and other baseball flair, this generously sized artwork will look great in any room of your home. For a gift that will knock the recipient's expectations right out of the park, you can't go wrong with this high-quality MDF vinyl-wrapped frame, glass and paper print. This Pittsburgh Pirates sports decor comes conveniently ready to hang.